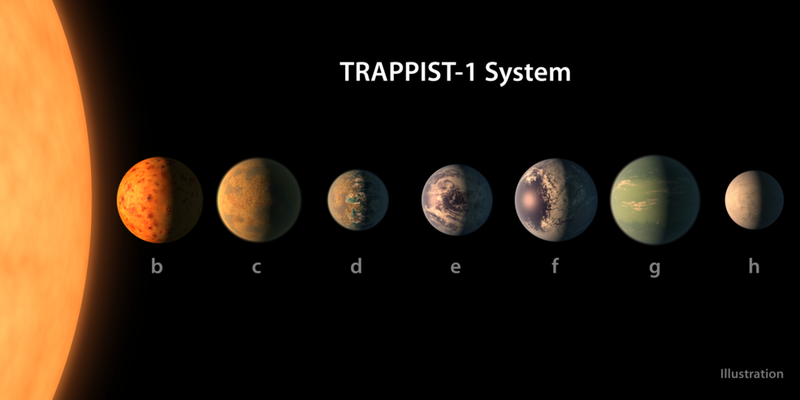 Recently, the discovery of seven Earth-size planets that could contain water was announced. The system, called the TRAPPIST-1, contains a group of planets orbiting an ultra-cool dwarf star. Therefore, planets very close to the “ultra-cool” dwarf star can hold liquid water, unlike our own solar system. Scientists are excited with this discovery because, based upon our knowledge from Earth, the existence of water is a precursor to the potential for life. These seven planets are also the closest exoplanets (planets not within our solar system) that may have water, at only 40 light years away from Earth. Meaning that if you were traveling at the speed of light it would take 40 years to reach the planets. This neighboring system can be understood by astronomers with the use of the Spitzer Space Telescope. Based upon the results taken from Spitzer and ground telescopes, scientists determined the duration of a planet’s orbit around the star, number of orbiting planets, distance of the planet to the star, approximate size of the planet, and the planets’ composition. Further studies will be conducted to determine the habitability of the planet and determine which substances could be found on the planet. Gillon, M.; Triaud, A. H. M. J.; Demory, B.-O. ; Jehin, E.; Agol, E.; Deck, K. M.; Lederer, S. M.; de Wit, J.; Burdanov, A.; Ingalls, J. G.; Bolmont, E.; Leconte, J.; Raymond, S. N.; Selsis, F.; Turbet, M.; Barkaoui, K.; Burgasser, A.; Burleigh, M. R.; Carey, S. J.; Chaushev, A.; Copperwheat, C. M.; Delrez, L.; Fernandes, C. S.; Holdsworth, D. L.; Kotze, E. J.; Van Grootel, V.; Almleaky, Y.; Benkhaldoun, Z.; Magain, P.; Queloz, D. Seven Temperate Terrestrial Planets around the Nearby Ultracool Dwarf Star TRAPPIST-1. Nature 2017, 542 (7642), 456–460.